← Which film should I review next? Nice review – 11/22/63 would be in my top 5. It’s 800+ pages but never less than spectacular! I’m slightly embarrassed to say that’s the only one I’ve read – so I’d be keen to read a top 10 to see what other ones (of his impressive catalogue) I should check out first! Ohhh – you definitely need to read some more King. 🙂 I’ll let you know when I do a Top Ten! I’ve bought this book and will be reading it soon. I love the plot, very intriguing. The book cover is amazing too 🙂 Great review. I know you say it’s spoiler free… but I still just kinda skimmed it for confirmations of my own expectations. 😉 I almost bought this last week… but there’s no rush. I’ve got at least 4 books I’d want to get through first. Glad to hear it’s worth checking out though. Cell was such a disappointment for me (started very strong, but fizzled out faster than usual for King), I haven’t really checked out much of his stuff since. Hehe – that’s okay. I also have a huge list of books to get through but kind of tend to drop everything to read a King book. I liked that it was a short & easy read – didn’t take long. I really liked Cell but that’s because it’s the type of thing I always go for (apocalyptic & “zombie-like”) but admit it was a very disappointing finale. Yes, started out great. The one I really loved that I think came out close to the same time was Duma Key. And I know 11/22/63 is a very popular one. I thought that was excellent but overlong – took a VERY long time for that one to really get going but then the second half was brilliant. 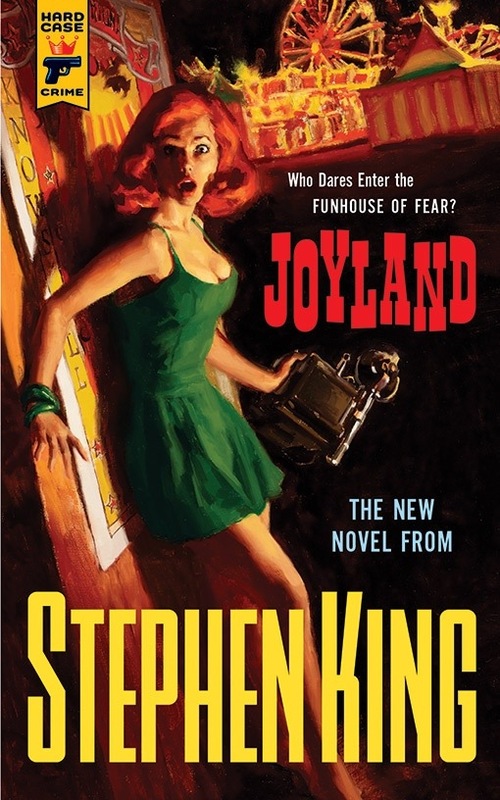 I really enjoyed Joyland too. It took a while for me to really get into it…I suppose I was expecting more emphasis on the crime and possibly the supernatural elements of it. However, this is a really good tale of coming-of-age and nostalgia. It has the “long hot summer” feel King gave Stand By Me with the heartfelt character relationships we saw recently in 11/22/63. This is definitely a book I could return to. Great job on this review. You hit on all the crucial points and didn’t give too much away. I do hope that King does write some more Hard Case Crime stories because I did thoroughly enjoy reading it even though it was on the lighter side.